One of my favourite comic book authors is Grant Morrison. He writes with so much energy and creativity, such a sense of fun, that so many of his comics are a psychedelic thrill ride exploring so many crazy ideas. One of Morrison’s most ambitious projects was DC’s Seven Soldiers of Victory, seven interlocking miniseries about seven different DC heroes who independently fight against an invasion of demonic fairies known as the Sheeda. One of these heroes is a reinvented version of the Shining Knight, a champion of King Arthur’s court who reawakens in modern times. While the original version of the Shining Knight was from the Dark Ages and the pseudo-historical King Arthur, Morrison’s version instead comes from a fantastical “ur-Arthur” thousands of years before recorded history. Basically, the archetypes of King Arthur and his champions appear over and over again in this world, each time in a different form. 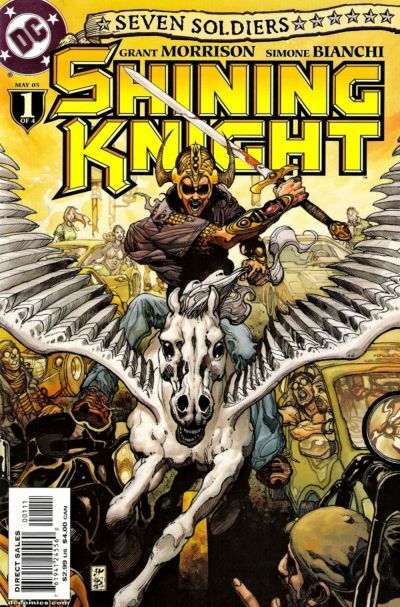 This prehistoric fantasy Arthur first appears in Shining Knight #1, which retells the famous Taliesin poem “The Spoils of Annwn”: “before the spoils of Annwn woefully he sang, / And thenceforth till doom he shall remain a bard. / Thrice enough to fill Arthur’s ship we went into it; / Except seven, none returned from Castle Revolving.” In the comic, Arthur’s army is at war with the Sheeda, and they battle to the Sheeda’s capital of Castle Revolving to steal their enchanted cauldron which is the Castle’s heart. Of Arthur’s men, none but seven return. Shining Knight #1 starts off powerfull and mythic: “From the far, unspeakable land of the Vampire Sun they came, from Eternal Summer’s End on Sheeda-Side….” It is clearly not some faux historical tale in the remnants of Rome nor a stiff and courtly Romance. It’s old myths, wild and fantastical. Sadly, beyond the basic premise of the poem (Arthur’s men go into Fairyland to steal the cauldron heart of Castle Revolving), Morrison is not especially interested in engaging with the original folktales. The idea that each knight has his own special power or trait is straight out of “Culhwch & Olwen,” of course. There are some other Welsh touches here. Gawain’s hawks probably reference his Welsh name, Gwalchmai (“Hawk of May”). “Peredur” is the Welsh name for Percival, the star of one of the Welsh Romances. The name “Caradoc” is very Welsh, though I haven’t heard of any prominent members of Arthur’s court called that. Olwen later shows up in the story. However, in folklore Gwalchmai’s defining trait is his politeness, whereas this Gawain is silent. This Peredur is obsessed with the Holy Grail (a Romance invention). Perhaps most prominently, Lancelot, Bors, and Galahad were all creations of the French Romances, and thus utterly alien to Welsh myths. Conversely, the comic has no references to Cai or Bedwyr, Arthur’s most devoted companions in the Welsh cycle. 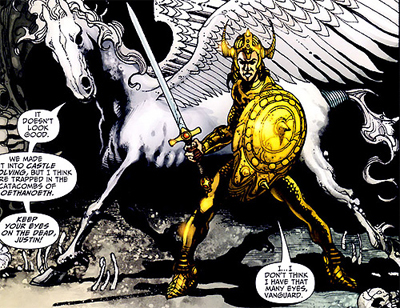 This entry was posted in Welsh Folklore and tagged Grant Morrison, King Arthur, Shining Knight. Bookmark the permalink.